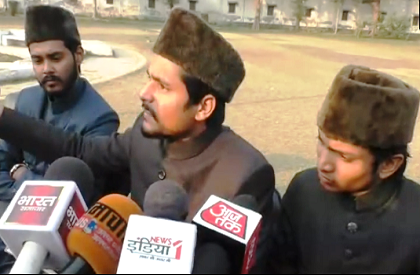 ALIGARH: Charging the SP-BSP alliance of making a big mistake by taking Muslims for granted, the Aligarh Muslim University Students' Union office-bearers have said that these parties must not ignore the Muslim voter and feel that they will get the support of marginalized sections without giving them due representation. Addressing a press conference, the AMUSU office-bearers have said that while the alliance leaders on one hand have been opposing the Congress, they have still left two seats for the party viz Amethi and Raebareli. However, they haven't even approached Muslim leadership, Muslim parties--ranging from Rashtriya Ulema Council to Peace Party and AIMIM, and are living in a make-believe world that Muslims would vote for them.The Union leaders have also reminded that how SP didn't even honour its promise of 18% reservation for Muslims in Uttar Pradesh. AMUSU secretary Huzaifa Amir said that these parties must give due representation to Muslims. 'Else, we can press NOTA and there are other options too. Muslims support is sought but the community is not given their due share in power.' "Why no stand taken on Muslim issues?". "BSP has Dalit vote and Akhliesh is leader of Yadavas but when they want Muslim vote, they must bring Muslims on board", he added. The AMUSU leaders said that during Mayawati regime too there were excesses on Muslims and during Akhilesh Yadav's rule, the Muzaffarnagar riots took place. "For seventy years, Muslims have witnessed it--the same ploy to get their votes. This won't work anymore. Muslims will support political parties or alliance only if they get due share in power and adequate representation as per their population. Otherwise we will try our own front and exercise other options".